The skyline of the northern Brickell neighborhood in downtown Miami. Its residential population has more than doubled in the past decade. 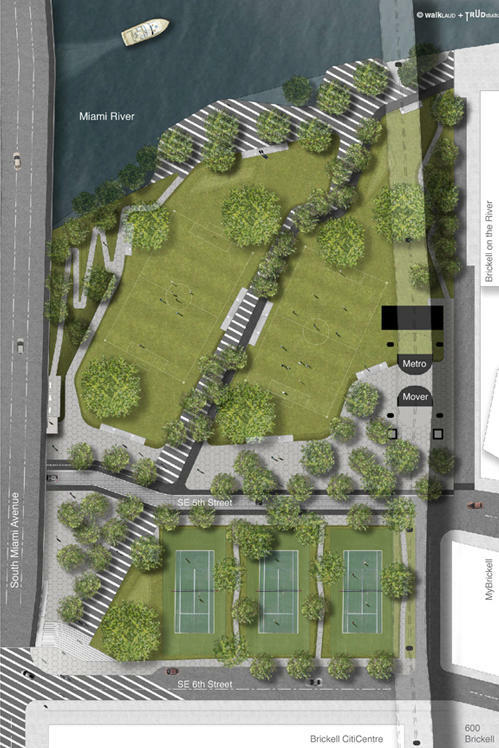 A site plan Brickell Green Space commissioned of the park it hopes to see built in downtown Miami. The space would include tennis courts, open fields and a jogging loop. 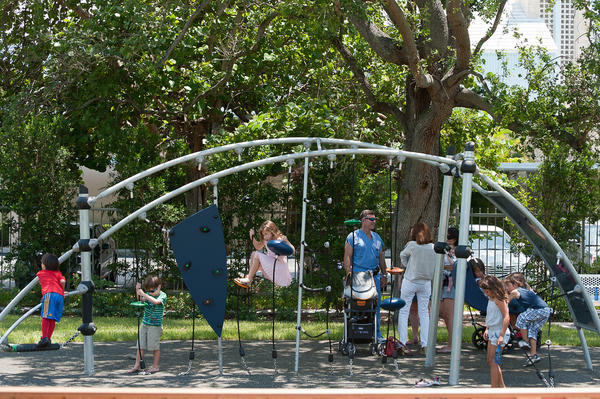 Children play at the 1814 Brickell Park, a new park that features benches, a paved path and a monument made of a girder from the World Trade Center. Many cities around the nation are trying to revive their downtowns, adding more apartments and condominiums — usually high-rises — to lure new residents. But as urban dwellers grow in numbers, they need places to get outside. Yet, in many cities, like Miami, neighborhood parks can be hard to find. The Trust for Public Land ranks Miami 94 on a list of 100 cities when it comes to park acreage per 1,000 residents — just 2.8 acres per 1,000 residents, versus 4.5 in New York and 6.2 in Los Angeles. 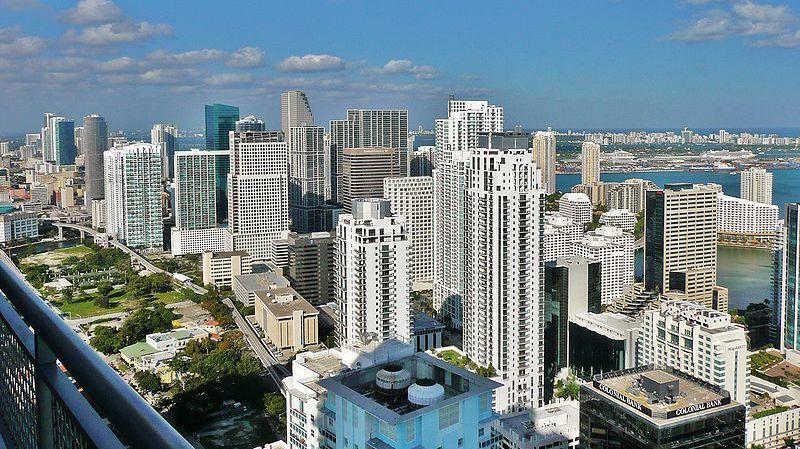 The parkland ratio is even lower in the downtown neighborhood of Brickell, where about 30,000 people live crammed together in a forest of condos. The neighborhood sprang up practically overnight. Brickell was initially a financial district, a kind of "must have" address for Latin American and European Banks. But the residential population more than doubled in the past decade. That's raised an interesting paradox — the more people want to live here, the harder it can be to make certain aspects of urban life actually livable. Advocates say parks are about quality of life. They break up the monotony of a densely developed area, they say, and provide places for people to exercise or simply gather. In Brickell, some residents hope to transform a vacant lot into a new urban park for the area. But there are varying visions of what kind of park the area needs. Blogger Craig Chester is part of a small group of advocates called Brickell Green Space. The group would like to see an empty plot of land beside a cluster of modern and sparkling 40- and 50-story towers transformed into a large park. "Until some of these giant condo buildings reach the end of their life cycle — which won't happen in my lifetime — this is really the last hurrah for undeveloped, raw, scrub parcel here in Brickell," Chester says. The spot would be large enough for soccer and baseball fields, a full-sized dog park and a view of the Miami River. Currently, there's nothing like that in Brickell. "I'd just love to come here after a day of work for a little bit of rest, an oasis, if you will, in the center of a very busy, bustling, vibrant place to live," Chester says. "Maybe there's live music in the band shell," he adds. "Maybe there's a small urban farm where people are tending to some of their herb gardens or vegetables. Maybe there's a dog walk where people are running Spot and Fido around." Chester's group has collected several hundred signatures on an online petition that supports a park in this location, next door to a billion-dollar mixed-use development that just broke ground. Maybe, Chester says, Brickell Green Space could persuade that developer to buy up the vacant land and build a park. After all, he says, parks add value to neighboring real estate. "We feel like we could find some private interests to really make this happen. And it's not that unfathomable," he says. Looking down from 100 feet up, at a city Metrorail station, the plot does look like it would make a great park. But down on the ground, the view is a little bit different. "Unfortunately, Miami's a frontier town where the dollars drive everything," says Peter Zalewski, who analyzes the real estate picture in South Florida. He says, despite the economic downturn, development in Miami is booming again. "We're standing under the shadow of a construction crane, which for the longest time was thought to be an extinct type of creature down here in South Florida," Zalewski says. "But it's suddenly re-emerged, just like the American bald eagle." And with that picture, Zalewski offers this reality check: Eleven more towers are slated to go up in downtown Miami, he says. During the recession, foreign money has poured into the city. And the lot the park advocates have their eye on was just purchased — and not by the developer Chester was hoping for. Instead, it was snatched up by Colombian investors for $28 million. "Effectively $256 a square foot," Zalewski says. At that rate, he says, a park would be a very pricey proposition. "I could not imagine a better park for greater downtown Miami than this site we're standing at right now," Zalewski says. "Unfortunately, for dogs to run around, and people to play Frisbee, and mothers to push their babies in strollers, it's just simply too expensive. It's not going to happen." "Well, I don't think anything is often impossible," says Maria Nardi of the Miami-Dade County Parks, Recreation and Open Spaces Department. "It may be possible, but it's not in the county's park plan." Nardi is standing at a different — and smaller — potential park site in Brickell, underneath a Metrorail track. "This is an area that the parks department is looking at to convert into a transit-oriented park," she says. Partly because of the extraordinary cost of land in this area, the county is looking to make parks out of land it already controls. In this case, that means directly under an elevated train, on a parcel that's only big enough for, say, a small amphitheater. "And I mean, people playing the guitar — one person playing a guitar or reading a poem. Whatever it might be," Nardi says. Brickell does have a brand-new park, at the opposite end of town about a mile from the vacant lot Chester has his eye on. The city held a dedication ceremony for the park, the 1814 Brickell Park, on a recent afternoon. Neighbors Ileana Norton and Melissa Bartolini were there in the park's playground, holding a 4-month-old and a 2-month-old, respectively. Bartolini says the small park was "just an ugly empty lot" before its transformation. This park was within the scope of what Brickell can afford, but it took years, and $4 million, to come together — including a huge donation from a private developer. "We live in the building complex across the street," Norton said. "But [we] just met here coming to the dedication ceremony today. ... I think it will be a very nice way to meet people that ... otherwise you don't even know, living in your own building complex." This may be the reality for a place as expensive and densely developed as Brickell: There will be enough space when the two mothers' children are big enough to swing from this jungle gym and spin around this crash-landing merry-go-round. But when it's time for T-ball or peewee soccer, their boys will probably have to go in search of greener, bigger pastures. And I'm Audie Cornish. And now to another addition of the NPR Cities Project. CORNISH: Today, efforts to put more green space in urban areas. Many cities these days are trying to revive their downtowns, adding more places for people to live - apartments and condos; usually high-rises. Those city dwellers need places to get outside but neighborhood parks can be hard to find. Kenny Malone, of member station WLRN, is standing by with a perfect example of this in downtown Miami, Florida. Hi there, Kenny. KENNY MALONE BYLINE: Hi, Audie. CORNISH: So we're talking about the quest for parkland. But the first thing I think when I think of Miami is beach. And isn't there plenty of access there people? KENNY MALONE, BYLINE: We've got loads of beautiful beaches. There's no denying that but this is a different kind of outdoor recreation space. People go to the beach and they get exhausted. It's not the place where you want to play baseball. It's not the place where you want to go see an outdoor movie, necessarily. So what we're talking about is a different kind of green space, and not necessarily a tourist destination, but a place where the locals, for the residents. CORNISH: And tell us where you are right now. You said you're in downtown Miami? MALONE: I am standing in the Brickell neighborhood of downtown Miami and I'm the on the edge of a vacant plot of land, sun-bleached dirt. You have views of a couple of palm trees or two but for the most part, barren. And yet, park advocates say this could be the Central Park for the Brickell neighborhood. And that's important because Miami ranked 94th on a list of a hundred cities by the Trust Republic Land on park acreage per resident. In Brickell it's even worse where people live in a condo forest. There are 30,000 residents here. It used to be a financial district that was a sort of must-have address for Latin American banks. It's become a residential hub. And it's raised an interesting paradox, that the more people who want to live here, the harder it is to make it livable in certain ways, for sure. CORNISH: So what kind of effort is really out there to create places where people can get outside? MALONE: Yeah. Well, there are varying efforts. Advocates say that parks are about quality of life, that they break up the monotony of a densely developed area and provide places for people to exercise or just a gathering spot. So what kind of park is part of the question. And to learn more about that I met with a guy who wants to see this very spot, where I'm standing, become a huge park. UNIDENTIFIED WOMAN: Please hold on, the train is approaching. Fifth Street. MALONE: Craig? Hey, man. I'm Kenny. CRAIG CHESTER: Hey, nice to meet you. MALONE: Good to meet you. Craig Chester is a blogger and a part of a small group of park advocates called Brickell Green Space. Now we're looking down at that plot of empty plot of land from up high on a metro mover station. And behind us are 40 and 50-story condo towers, modern and sparkling white. CHESTER: Until some of these giant condo buildings reach the end of their lifecycle, which will happen in my lifetime, this is really the last hurrah for undeveloped, raw, scrub parcel here in Brickell. MALONE: The spot would be big enough for soccer fields, baseball fields, a full-sized dog park and a view of the Miami River. There's nothing like that in Brickell. CHESTER: Yeah, I mean, I just love to come here after a day of work for a little bit of rest, an oasis, if you will, in the center of a very busy, bustling, vibrant place to live. MALONE: Put me in Craig Chester's shoes 10 years from now. You get the park, what is Craig Chester using the park for? CHESTER: Maybe there's live music in the band shell. Maybe there's a small urban farm where people are tending to some of their herb gardens or vegetables. Maybe there's a dog walk where people are running Spot and Fido around. MALONE: Chester's group has a few hundred signatures on an online petition that supports a park in this location. It's next door to a billion-dollar mixed-use development that just broke ground. Maybe, he says, Brickell Green Space could convince that developer to buy up the vacant land and build a park. After all, he says, parks add value to neighboring real estate. CHESTER: We feel like we could find some private interests to really make this happen. And it's not that unfathomable. MALONE: From a hundred feet above, looking down, this would undoubtedly make a great park. But the view is a little bit different down on the ground here. PETER ZALEWSKI: Unfortunately, you know, Miami is a frontier town where the dollars drive everything. MALONE: Will you introduce yourself before we move on? ZALEWSKI: Yeah. My name is Peter Zalewski. I founded a company in 2006 called Condo Vultures. MALONE: Maybe you can explain why it's loud in the background. It's probably not the reason people would expect during a housing bust. ZALEWSKI: We're standing under the shadow of a construction crane, which for the longest time was thought to be an extinct type of creature down here in south Florida. But it's suddenly re-emerged, just like the American bald eagle. MALONE: Zalewski analyzes the real estate picture in south Florida and he offers this reality check: 11 more towers are slated to go up in downtown Miami. During the recession, foreign money has poured in and this lot, Zalewski says, was just purchased but not by developer Craig Chester was hoping for. It was snatched up by Colombian investors for $28 million. MALONE: So, theoretically, if this were a park and Zalewski went for a stroll, he'd take a step, $256. Another step, $256. ZALEWSKI: Two hundred and fifty-six dollars. I could not imagine a better park for greater downtown Miami than this site we're standing at right now. Unfortunately, for dogs to run around, and people to play Frisbee, and mothers to push their babies in strollers - just simply too expensive. It's not going to happen. MARIA NARDI: Well, I don't think anything is often impossible. MALONE: It may be possible but it's not in the county's park plan. Maria Nardi is with Miami-Dade County Parks and Rec. She brought me to a different, smaller potential park site in Brickell. MALONE: In part because of the extraordinary cost of land in this area, the county is looking to make parks out of land they already control. In this case, that means directly under an elevated train, on a parcel that's only big enough for, say, a small amphitheater. NARDI: And I mean, people playing the guitar. One person playing a guitar or reading a poem, whatever it might be. MALONE: Let's go see one more site where there is a brand-new park, within the scope of what Brickell can afford. MALONE: You're holding a 2-month-old. MALONE: And you're holding a 4-month-old. MALONE: You like this park? We're a mile away from Craig Chester's vacant land at the opposite end of Brickell. This site took years to come together and $4 million, including a huge donation from a private developer. What was it like before this park was here? BARTOLINI: I think it was just an empty lot. Right, Ileana? BARTOLINI: Just an empty lot - just an ugly, empty lot. NORTON: We live in the building complex across the street, but just met here. So it's a nice - I think it will be a very nice way to meet people that, you know, you otherwise would not even know, living in your own building complex. MALONE: This may be the reality for a place as expensive and densely developed as Brickell. When Miles and Santiago get big enough to swing from this jungle gym or spin around this crash-landing UFO, there's room for that here in Brickell. But when it's time for T-ball and peewee soccer, the boys will probably have to go in search of greener, bigger pastures. At 1814 Brickell, Kenny Malone for the NPR Cities Project. CORNISH: You can follow the Cities Project on Twitter @nprcities. And with Isaac bearing down on the Gulf Coast, we'll be discussing cities and the environment today in a Twitter roundtable discussion. We've been covering the idea of resilient cities. We're joined on Twitter by several urban planning writers and experts. They've been thinking about how cities can prepare for environmental disasters and the effect of climate change. Just follow the hash tag nprcities and tag your own tweets the same way. And if you're not on Twitter, you can see the conversation as it takes place at our website, NPR.org/nprcities. Transcript provided by NPR, Copyright NPR.